gone, preserved only in memory or in lines written by a great poet. Precious stones, more than any other thing, which are lovely to the eye, endure through time, and in terms of human measurement are eternal. 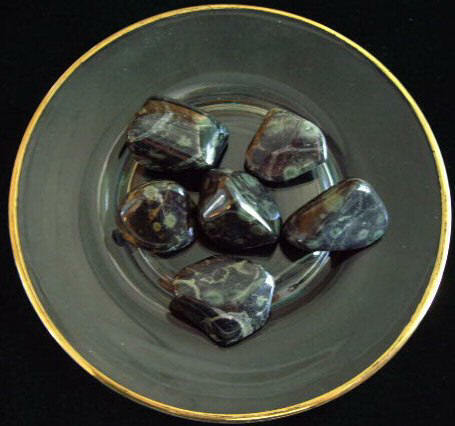 Nebula Stone Nuggets ( Nebula Nuggets ) are Tumbled Stones made from large boulders, which have been broken into various sizes of smaller pieces and then tumble Polished. 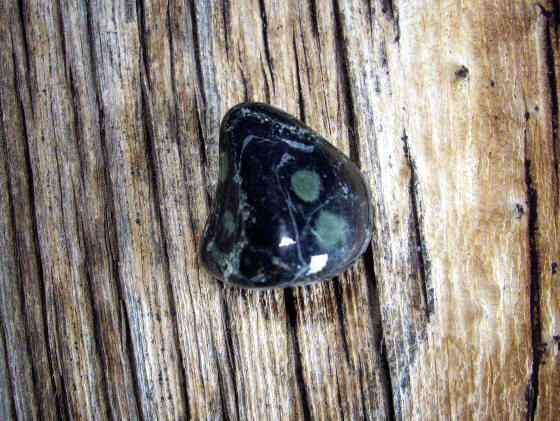 Used for Aquarium Gravel, Aquarium Stones, small Pocket Stones, Medicine Stones, Therapy, Reiki, Chakra, Energy Grids, Runes and Jewelry... Wire Wrapping . These tumbled Nebula Nuggets are also being used as a commemorative for celebratory occasions ...birthdays, graduations, weddings, and for ceremonials in celebration of the cycle of life. Here is a link to how Katrina Raphaell used Nebula Nuggets at the seaside memorial ceremony for her dear friend in Hawaii. These Nebula Stone Nuggets are much smaller than the Nebula Palm Stones. Please see the measurements listed below the Nebula Nuggets. This Nebula Nugget is much nicer than the pictures. 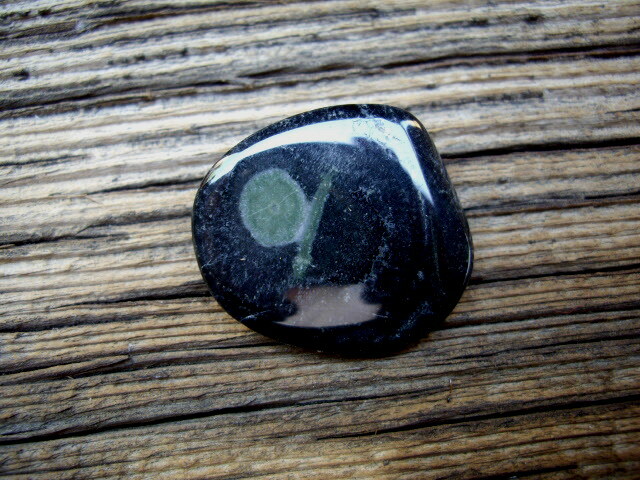 The rivers of quartz in this stone can make it difficult to capture the true image. It is has a very nice flat back for making into a pendant. This Nebula Nugget is blessed with an abundance of Green Nebula Eyes. 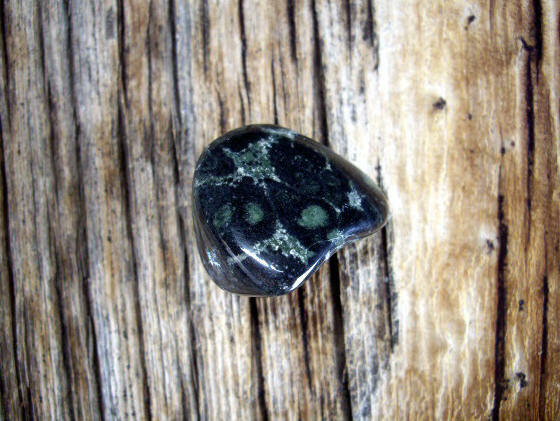 This side of the Nebula Stone Nugget has a very flat back making it ideal for fashioning into a pendant. It is a very high polish and simply a beautiful stone! 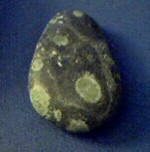 For larger size Nebula Stones please go to the Nebula Stone Palmstones page. 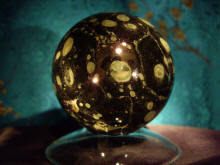 Or go to our Exquisite Nebula Stone Palmstones page which are our High-graded Nebula Palmstones of the highest quality. Sighting above is flying saucer with cargo of Nebula Stone Nuggets. Keep a twinkle in your eye and in your pocket. Medicine Stones are small Nebula Tumbled Stones for enhancing Medicine Pouches and making Arts and Crafts, Aquarium Gravel, Gem trees, Jewelry, Drillable Beads, Necklaces, Earrings, water fountains, charms, bath stones, under your pillow stone, Therapy Baths, elegant safe enhancement of Aquariums. 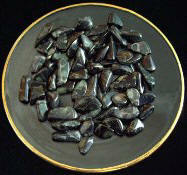 These small tumbled Nebula Stones are being used in ceremonials in celebration of the cycle of life. Katrina Raphaell "Letting Go"
are much larger and more rounded and natural shaped than the much smaller little tumbled stones we have sold to stores, web sites and EBay resellers. are NOT available in stores and are NOT available on other web sites that we sell to. 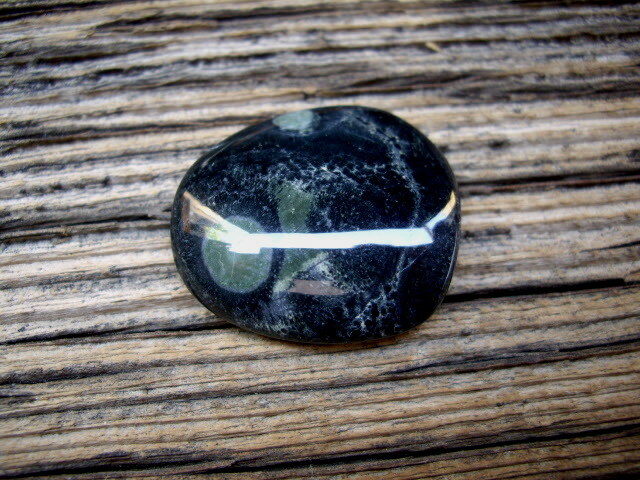 These much rarer and much larger Nebula Stones are now available exclusively on our Nebula Stone Palm Stones page. 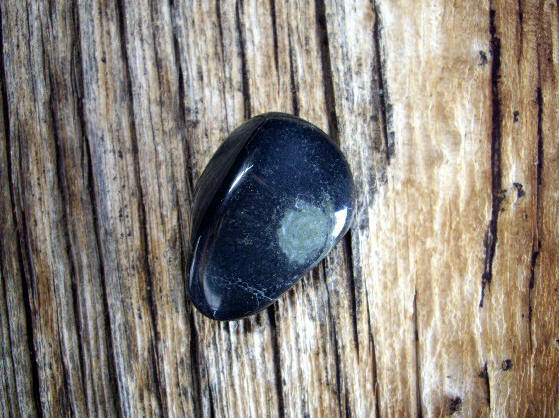 Nebula Stone Palm Stones are the larger stones we find individually and are the very rarest of Nebula Stone and hardest ones to find. 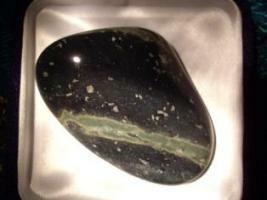 Our Nebula Stones are larger and more rounded and natural shape than Nebula Nuggets. 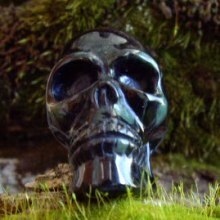 They are naturally river tumbled by Mother Nature, and are considered, by far, the most appealing and soothing to the touch of our Nebula Stones. Available in Polished or Natural unpolished. 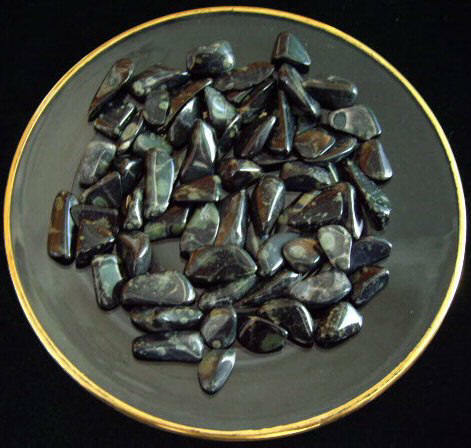 These Nebula Stone Tumbled stones are available in all sizes from pocket size to very large collector, museum specimens. 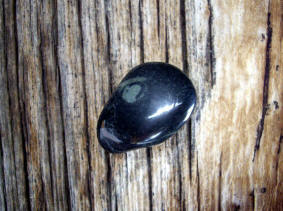 Our Natural unpolished Palm Stones are river tumbled, being shaped naturally by Mother Nature. When held and worked with for massage, your natural oils darken the matrix highlighting the greener Nebulas. Each Nebula Stone is just like ourselves...Uniquely One-of-a-Kind with different patterns and varying shades of green. The tumbling and polishing may not remove the normal lines, cleaves and natural inclusions from a stone which are a natural part of their evolution. 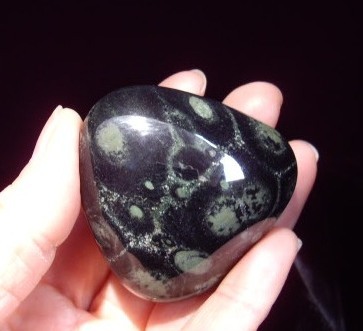 Like the Nebulas in outer space, each Nebula Stone is unique. Examples of three Nebula Stone Palm & Pocket Tumbled Stones and a Starburst Nebula Stone. "Nebula Stone has magic in it." "It is highly desirable for use by healers and therapists"
"It's my fastest seller. My customers love the feel of it and it's energy! 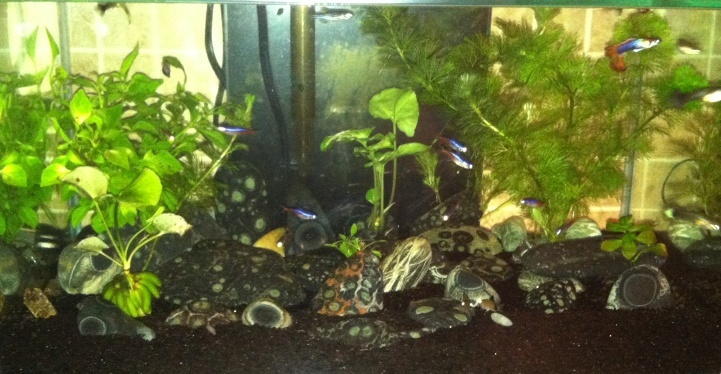 Once they pick up Nebula Stone, they can't put it down. I have been in the business over 45 years and...There is no question... It is THE STONE !!" "Finding your Web-Site was kind of like finding a patch of 4 leaf clovers." "one of the nicest Web-sites we have seen on the Web." 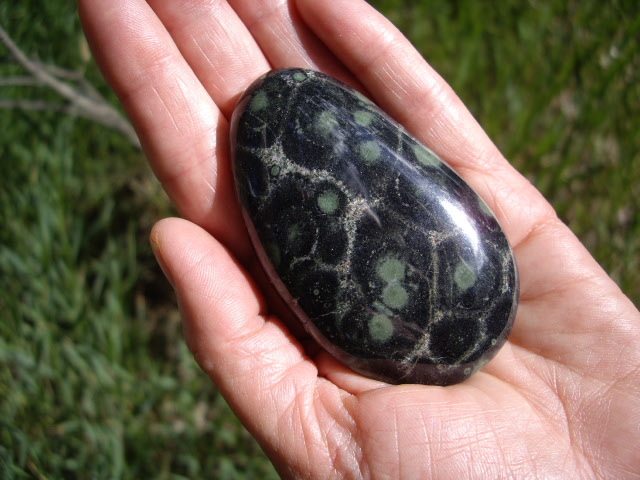 "I was just looking at Nebula Stone's NEW LARGE Palm Stones page...WOW!! Wish I could hold one!!!" 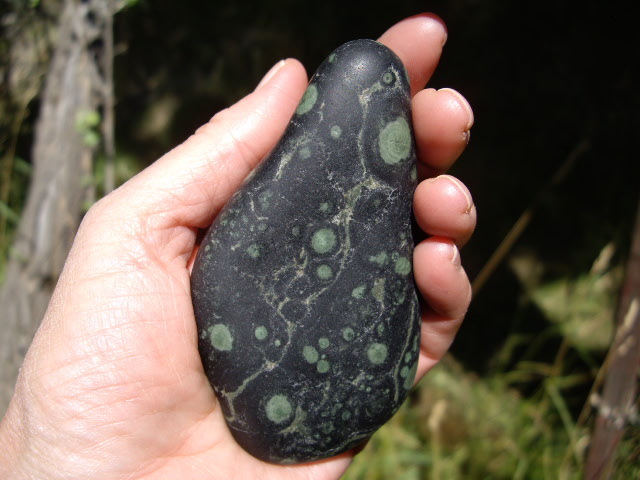 Hold your Nebula Stone in your hand... and let your stone guide you on a journey with us to the Gifted Valley. 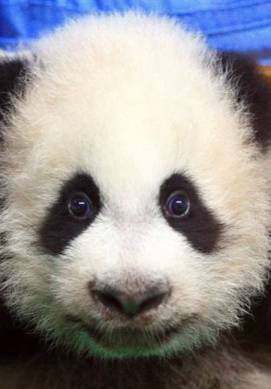 * We are not set up for online shopping cart buying... so please E-mail us for a purchase.